Sail through the turbulent seas of Spanish grammar and communicate with confidence! 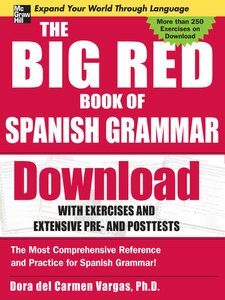 The Big Red Book of Spanish Grammar gives you a comprehensive and yet accessible resource for all your grammar needs. Instead of poring through several grammar textbooks and workbooks, everything you need to build your grammar mastery is right here.